The GPS camera CONTOUR ™ revolutionizes the video board sport shooting your exploits with the route (GPS position, km / h, altitude). 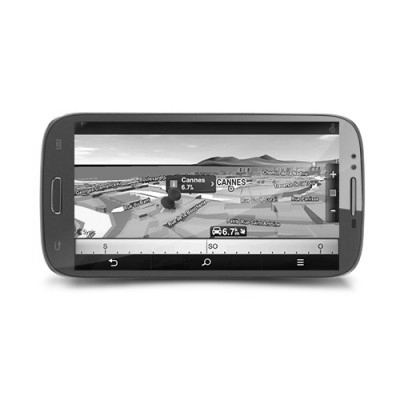 The onboard camera Contour ™ GPS is the perfect combination between the contour HD 1080p and a GPS receiver. 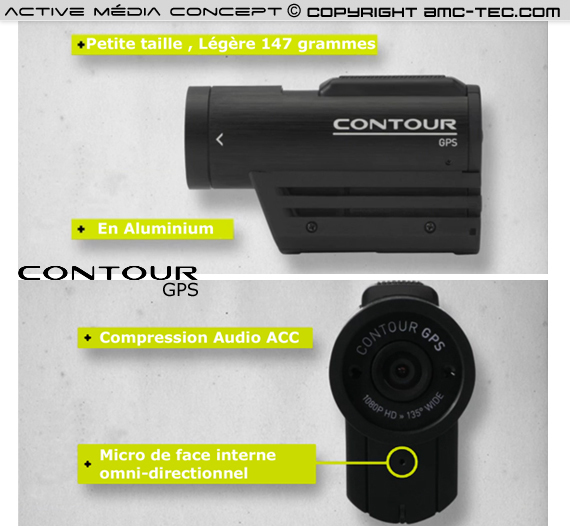 Small and lightweight (150 grams) camera embeds GPS CONTOUR HD video cameras and portable GPS receivers. 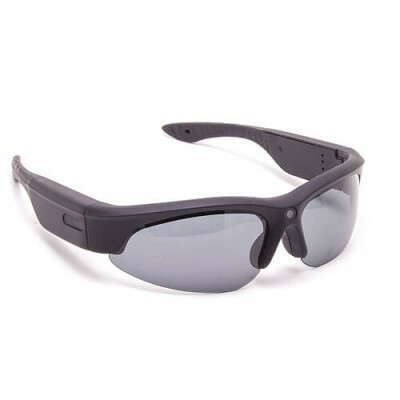 The contour GPS boasts a 360 degree rotating lens and 2 lasers that will ensure a perfect framing. Very easy to use: Just drag a single oversized button (accessible even with gloves) to start recording or take several pictures. 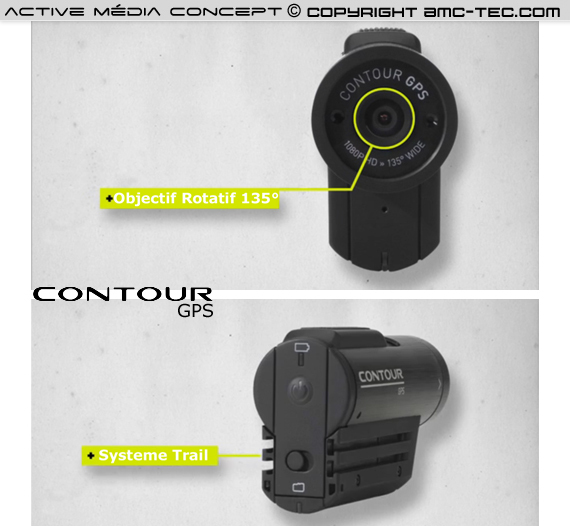 A GPS receiver is built into the camera CONTOUR ™ GPS that you record your position (latitude longitude) several times per second with pinpoint accuracy, so it is able to save your position, speed in km / h and vertical drop, while keeping Portable. Watch your route via Google Maps ™ interactive map and the video shoot. You can then compare to your old stats and you can challenge your friends to see who is the best! You can then edit comments and route topos complete with software CONTOUR ™ Story Teller (included). 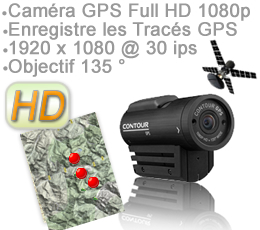 The camera captures video Contour GPS Full HD 1080p exceptional quality. With its wide-angle and 135 ° rotating lens, this camera offers high image quality and you will capture the entire scene filmed with minimal distortion (reduced effect Fish Eyes). 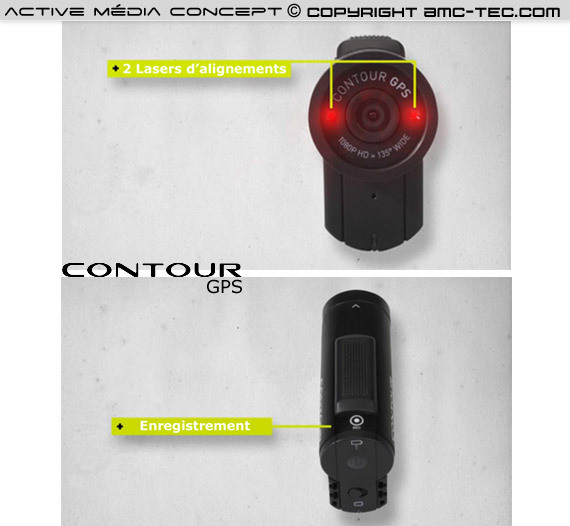 However you can choose between 5 resolutions and video camera mode. 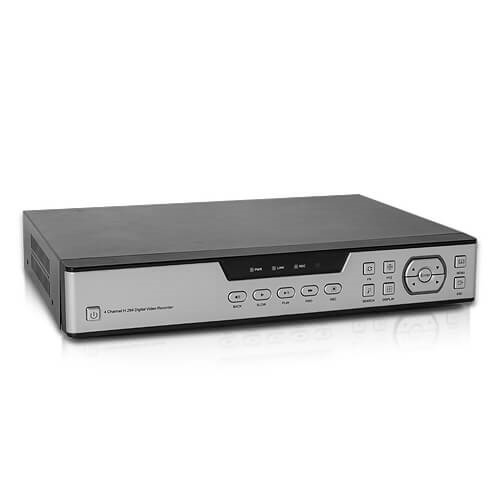 Full HD - 1080p: 1920x1080 pixels / 30fps / 15 minutes per GB: For the best quality to fill big TV screens with high definition images (such as Blu-Ray). 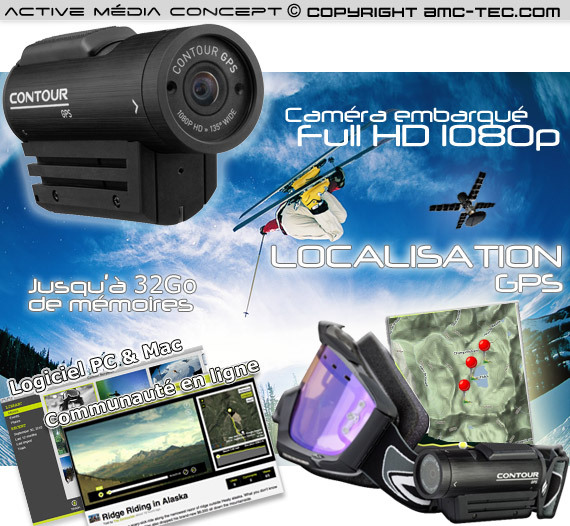 Tall HD - 960p: 1280x960 pixels / 30fps / 15 minutes per GB: for sports like surfing, where a wide picture gives a better rendering. 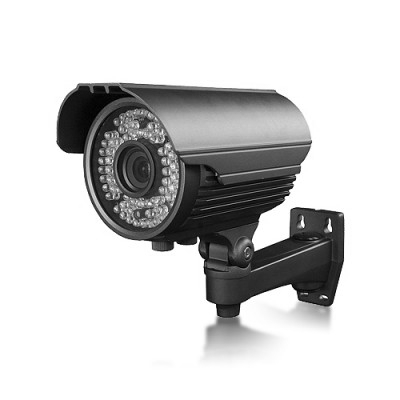 Action HD - 720p: 1280x720 pixels / 60fps / 15 minutes per GB: when the frame rate per second is more important than resolution, this mode is ideal for filming earlier actions, this reduces blurring and distortion image. Perfect settings for slow motion quality and exceptional smoothness. 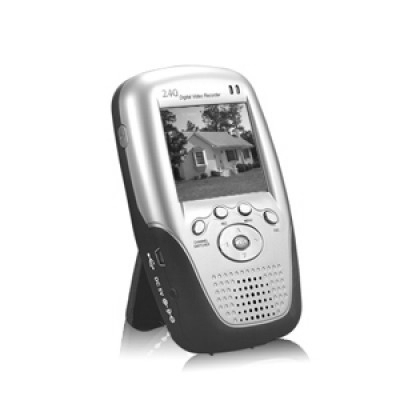 True HD - 720p: 1280x720 pixels / 30fps / 30 minutes per GB: This mode is not greedy in memory, this will allow you to shoot your longest trips. Photo mode: 2592x1944 pixels choose up to 6 speeds shooting every 1, 2, 5, 10, 30, or 60 seconds The key to taking pictures! 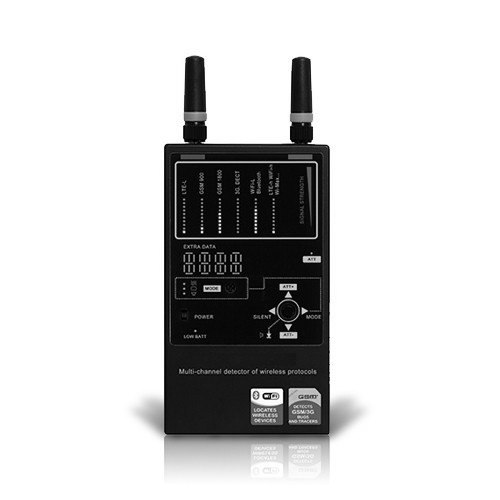 Developed by engineers, the new omnidirectional microphone captures sound and reducing wind noise while keeping intact the sounds that you will hear every whisper or shout, AAC audio compression is used in a better Record sound quality. Of course you watch your journey on Google Maps ™ interactive map and check your stats and performance. It is possible to share with the button Twitter, Facebook & MySpace videos in one click. A community is offered in order to share your favorite moments with the camera filmed extreme. To show your achievements? Visit www.contour.com for sharing videos, stories and map data with the community CONTOUR. Warranty: Contour (formerly Twenty20 VholdR) warranties the ContourGPS for 180 days from the date of purchase of product, unless otherwise indicated by your local government’s warranty laws. The warranty applies only to defects in material and workmanship and not situations caused by impacts or abuse. For complete warranty information, please refer to the Product Information Guide.